BANGI, 6 November 2014 – An indigenous land dispute resolution (ILDR) system for Malaysia’s indigenous people is sorely needed as the country faces rising opposition against land development projects in both the Peninsular and Sabah and Sarawak. A Senior lecturer at The National University of Malaysia (UKM) Law Faculty, Associate Professor Dr Rohaida Nordin said existing laws and institutions are not adequate to guarantee total protection of the country’s indigenous peoples. She was presenting a paper on Indigenous Land Dispute Resolution Mechanism at the first session of the Research and Innovation Congress 2014 here today. The congress is organised by UKM’s Political and Security niche. Dr Rohaida said the present dispute resolution system does not meet the needs of the Orang Asli and the Pribumis as the mechanism fails to observe their distinct social and cultural elements. The gaps and inadequacies had resulted in injustices against the indigenous peoples, especially the Orang Asli, causing disruptions to the sustainable land development agenda. 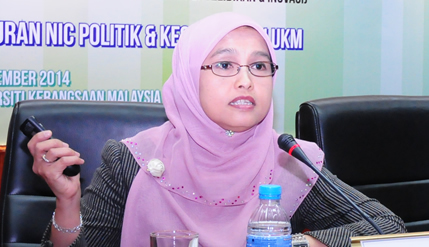 She said the main objective of her research group which she heads was to investigate the need to establish a method to resolve land disputes involving the Orang Asli and the Pribumis. “Malaysian laws do not give recognition to the Orang Asli Customary land. Only individual stake holders are recognised,” Dr Rohaida said. Her research led her to the Malaysian Human Rights Commission (SUHAKAM) which proposed that the federal government set up an Indigenous Land Tribunal or Commission, a Native Title Court or an Ombudsman or a mediation mechanism. Malaysia must give due attention to the problem because as a member of the United Nations, it is obliged to comply with the UN Declaration of the Rights of Indigenous Peoples and the Legitimacy of Indigenous Peoples’ Rights, she said. Dr Rohaida said claims that the UN charter was only a declaration and not a binding agreement was only an excuse to avoid fulfilling responsibility to native peoples. “But I believe, Malaysia has a moral responsibility because Malaysian law must be compatible with International Law,” she said. The Akta Orang Asli 1954 (APA 1954), for example, was passed to protect the well-being of Orang Asli communities in Peninsular Malaysia but the present laws are still inadequate, she said. Her research team will provide recommendations based on extant practices and laws for an alternative ILDR mechanism, which should empower the indigenous peoples to have autonomy and self-determination. It will also assist the government to meet its objectives in creating a sustainable land development agenda as part of the economic transformation plan. Dr Rohaida holds a PhD in Law from Lancaster University, United Kingdom. She specialises in International Human Rights Law and Rights of Indigenous Peoples. The congress was opened by Deputy Vice-Chancellor (Research and Innovation) Prof Dato’ Dr Mazlin Mokhtar, who challenged the niche to study the possibility of turning Kudat in the north-eastern tip of Sabah into a Marine Park to encourage sustainable development in the border area. Prof Mazlin said the area which had seen security breaches recently and is a porous border may also be an economic asset if properly developed. Also present was Chairman of the Politics and Security Niche Prof Dr Rashila Ramli and Deputy Dean of the of the Faculty of Social Sciences and Humanities (Post Graduate and International Relations) Prof Dr Fuad Mat Jali.